No matter how old we are, our heart always yearns for adventure. Trekking is a very famous adventure activity in and around Hyderabad for its local peoples and moreover for its travelers. There are some amazing spots around Hyderabad that offer the greatest trekking experience. Now, we share some adventure trip getaways from Hyderabad that have thrill factor by quite a few notches. Ananthagiri Hills: The Ananthagiri hill is full of lush green forest in the Ranga Reddy District. The origin of Musi River is Ananthagiri Hill, which flows over the city of Hyderabad. Adilabad: This place, Adilabad has three wildlife sanctuaries, two waterfalls and a lake to see – hence there are sufficient adventurous and trekking activities to do. Koilkonda Fort: To reach the place, one has to trek through a deep ravine on the west and if it has to get hold over east, there is a steep set of steps that leads to the fort at the top. One has to cross Seven Gates to go in the Koilkonda Fort. 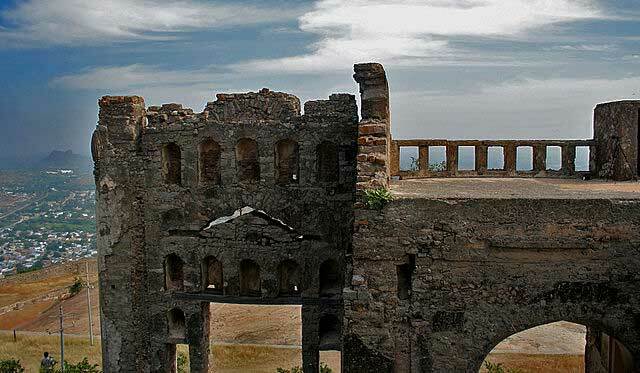 Bhongir Fort: This Bhongir Fort was built in the 12th century by a Chalukya ruler. It takes an hour-long trek to reach the top of the Fort. Dandeli: This place Dandeli has adequate wonders hidden up its sheath for the adventure hunter. The explorers can venture down the thousand-odd steps headed for the Kavala Caves. River rafting is another adventurous activity in the River Kali. Lastly, the Anshi Tiger Reserve in Dandeli is an eco-tourism spot with the variety of birds and beasts. And enjoy jungle safari! Belum Caves: Belum Caves are the longest caves in India. In addition to that, it has long chambers and some really outstanding sights within. A captivating perennial stream deep side the cave known as Patalganga. Do remember to visit the part that was used by Buddhist monks as a meditation hall, and the huge Buddha statue on a hillock over the cave.